Ingredients: Deionized Water, Extracts of: Aloe Vera, Comfrey, Watercress, Myrrh, Panthenol, Anthemis Noblis Flower (Camomile), Symphytum Officinal Leaf (Comfrey), Equisetum Arvense (Horsetail), Urtica Dioica (Nettle), Rosemarinus Officinalis Leaf (Rosemary) ,Humulus Lupulus (Hops), Lawsonia Inermis (Henna), Certified Organic Essential Oils: Lemon, Vanilla Extract, Polyquarternium11, Soyamid DEA, PPG30, Cetyl Ether, Oleth-3 Phosphate, Hydroxypropyltrimonium hydrolyzed wheat protein, Phenoxyethanol. * Great smell, very light. * Great smell. The fragrance is very light, not over-powering. Overall Thoughts: I used the Nutrient Replenishing Conditioner to co-wash my wash and go. I really like the conditioner. After using it to co-wash, the conditioner left my hair soft, tangle free and moisturized. The conditioner worked well with my other hair care products, it has a light pleasant smell. I would definitely purchase again (online of course). 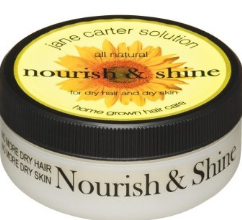 Overall Thoughts: I added Jane Carter’s Nourish & Shine along with B.A.S.K’s hair milk after co-washing my hair with Jane Carter’s Nutrient Replenishing Conditioner. I do like the Nourish & Shine product. The consistency is smooth and silky as it melts instantly in the palm of your hand, doesn’t leave your hair greasy or weighed down. For me, the scent can be a little domineering and did compete with the perfume I was wearing that day. However, the smell is very pleasant and could be worn as a perfume scent by itself. Personally, I will skip the perfume the next time I use the product in my hair. The Nourish & Shine product did keep my hair moisturized all day and did not weigh down my curls.